A group of University of Windsor engineering students are doing things the hard way. 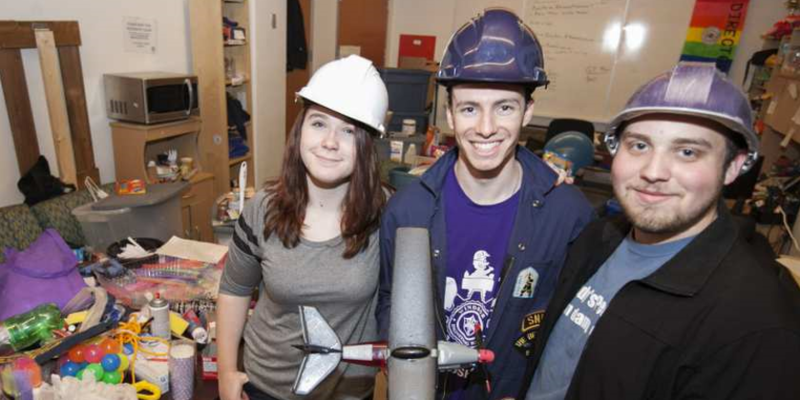 As part of the lead up to National Engineering Month in March, the students are constructing a Rube Goldberg machine to help other universities across Ontario light up the CN Tower. A Rube Goldberg machine is a complicated machine designed to do a simple task using chain reactions. At University of Windsor, that means answering a call on Skype then dialing the next university in the chain. The U of W machine will take a call from McMaster University and send one to Carleton University. The final call will trigger the machine from the last school in the chain to light up the CN Tower on March 1. “At the end of the chain the CN Tower will be lit up purple based on all the universities working together,” said Callen Deketele, 18, a first-year mechanical engineering student. The University of Windsor’s Internet call will begin with a plane on a zip line which will trigger a toy car to speed down a Hot Wheels track on a flight of stairs. The car will launch onto a table and push ahead another car. That car will pop a balloon, which will trigger a weight to fall into a basket. That will knock over a Jenga tower, which will trigger a pneumatic machine to push the button to call the next school.